Twitter is delivering four times the revenue per visitor this year over last year, and Facebook’s ad click-through rate has jumped 275 percent, according to the Q3 Adobe Social Intelligence report, released today. But it’s still undervalued by advertisers because of one unique factor. Screen Shot 2013-10-28 at 7.48.38 AMIn other words, your journey to purchase includes social, but perhaps not as the last step. And in digital advertising, last-mile solutions — which are often a web search for a specific product or the best-price retail outlet — get paid the most. Which is why, of course, Google is so wealthy. 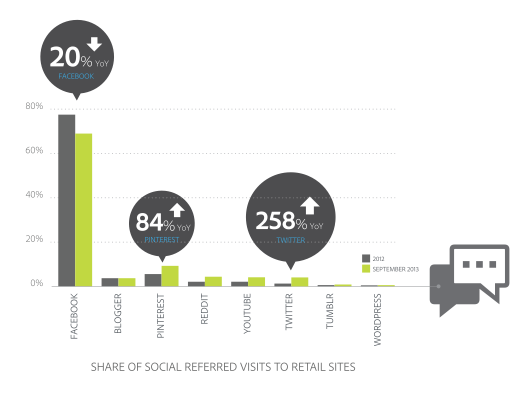 But for brands, the key take-away is that social often starts the purchase journey, meaning that it’s even more critical to be active on Facebook, Twitter, Pinterest, and other social networks than ever before. 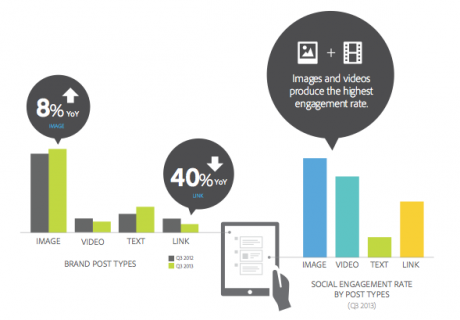 Much of that influence can be via earned and owned media, with likes producing a full 87 percent of all social engagement on Facebook, Adobe’s report says, and brand posts with images producing 600 percent higher engagement rates than posts with just text. But paid media is getting more and more attractive too. Facebook’s cost-per-click (CPC) is down 40 percent this year over last, and it’s click-through rate is up 275 percent — a very nice combination for anyone in marketing. That, as well as the social network’s growth, has led to click volume that’s up 29 percent year-over-year and Facebook ad impression volume that’s up 85 percent year-over-year. Screen Shot 2013-10-28 at 7.51.15 AMThat’s good news for the soon-to-IPO social network, especially given recent news that some ad networks are seeing decent revenue per visitor from Twitter, but such low click-through and engagement rate that they are abandoning Twitter. 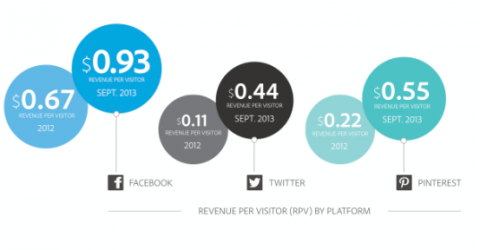 Facebook still leads at $0.93 of revenue per visitor, up from $0.67 last year, but Twitter is way up. Pinterest has jumped as well, hitting $0.55 this year compared to $0.22 revenue per visitor in 2012. In addition, while Facebook still has the lion’s share of social visitors at 67 percent of all social referred visits, Twitter skyrocketed 258 percent this year, more than doubling Pinterest’s growth, and Facebook dropped from 77 percent. All that social influence is not going unnoticed, Adobe says, and next year, it will provide better monetization for the social networks. “Next year, we’ll see better attribution tools,” Gaffney told me. That means advertisers will be able to tell with greater accuracy exactly how a particular buyer reached his or her buying decision, with various steps in social, search, and other sites, and attribute the value of that sale more equitably across the various platforms. That can only mean good things for Facebook, Twitter, and Pinterest.